Resource: National Archives of Japan | What can I do with a B.A. in Japanese Studies? Interested in archives or history? Check out the digital collection available through the National Archives of Japan! The National Archives of Japan (NAJ) Digital Archive provides access to digitized images of preserved historical records. Users can search for the descriptions and view the digitized images of the records within their collection. There are 1.23 million volumes (approximately 6.12 million images) divided into two major categories within the NAJ: The Government Records and the Cabinet Library and Important Cultural Properties. The Government Records and the cabinet library contains description of about 750,000 volumes which were transferred from the ministries and agencies of the government of Japan. There are 480,000 volumes of both Japanese and Chinese books offered. Records are continually added to the collection including records related to the Constitution of Japan, reformation of the administration after World War II, etc. Important Cultural Properties provides over 1,400 digitized records of original resources like the Constitution of Japan, a picture map of the Shinbashi-Yokohama Railroad, maps compiled by the Tokugawa Shogun in 1848, etc. There are several ways in which a user can search for resources on the NAJ. For a new user, one of the easiest things would be to browse through the digitized items initially designated by categories: Documents, Maps, Scrolls, Photographs, Drawings, Posters. By clicking on Photographs, for example, people will have the opportunity to examine photographs of Aizuwakamatsu Castle in 1873. A great feature in examining the photographs is looking at the image either as a standard jpeg or an advanced jpeg. The advanced jpeg allows users to look at the image as if it’s under a microscope giving you the opportunity to see the item with greater detail (such as the intense disrepair of Aizuwakamatsu castle!). Additionally, users can easily browse by region: Hokkaido, Tchoku, Kanto, Chubu, Kinki, Chugoku, Shikoku, Kyusyu. After selecting a particular region, users can go even further within the area and explore resources within a particular territory. For instance, after clicking within Kanto, you can select Saitama and discover the digitized resources there. What may be lost by the casual user is that there is a drop down menu which allows users to change their search habits by using a Simple Search, Layered Search, Important Cultural Category Search, Important Cultural Area Search, and Cross-file Search. Academics who may have a little difficulty navigating Japanese documents may prefer exploring resources through the Layered Search option. Users have the option of selecting Administrative Records, Judicial Records, Corporate Records, Donated/Deposited Records, and Cabinet Library. Even further they can select embedded folders within the item before entering their search item. This may be easier for use while still locating primary resources. Fluent Japanese speakers may prefer using the Simple Search in order to receive the highest recall with best precision to meet their needs. However, if you’re a super searcher that’s fluent in a couple of languages, I think the best option would be the Cross-file Search Advanced Search Option. 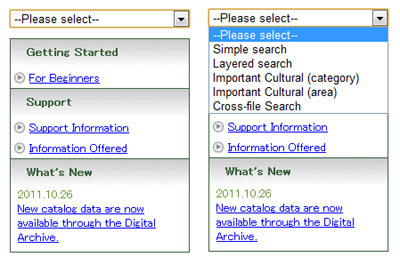 The searcher can utilize many search options while still selecting many databases within the NAJ: National Archives of Japan, Japan Center for Asian Historical Records, the public records database of Okayama Prefectural Archives, Historical documents database of Okayama Prefectural Archives, Nara Prefectural Library, and the NACSIS Webcat (through the National Institute of Informatics). The National Archives of Japan is an excellent resource for users to locate many primary resources related to Japan. The site offers an excellent FAQ section as well as a great “For Beginners” section on how to best utilize the site. People with little or no Japanese language skill will find the the site useful and informative. Casual history buffs, scholars and academics may find many of the resources to be of great value. I encourage you to check out the National Archives of Japan! This entry was posted in culture, fun links, graduate school, study tools, undergraduate, useful links and tagged archive, digital archive, documents, government, maps, National Archives of Japan, photography, research, resources, scrolls. Bookmark the permalink. Awesome! Thanks to tnguyen3729 for the heads-up! Now I know what to do this lazy Christmas Sunday!